Styled with keith jacket and perry turtleneck . 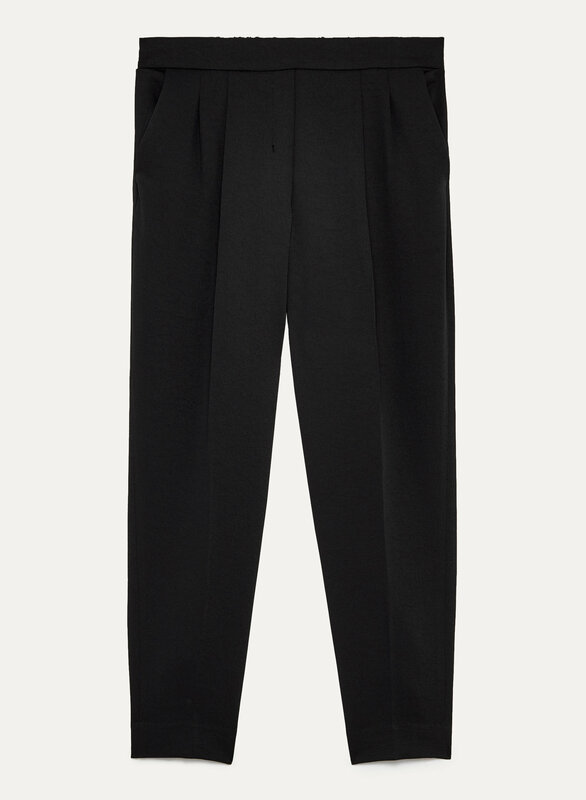 Babaton's ultra-versatile Cohen Pant, redone in a luxe basketweave fabric. Made in an innovative Japanese mill, this soft material has a subtle raised texture and a beautiful drape. My favorite pants for work! Excellent Fit - Five Stars! This cohen pant pique is perfect - it has a basket-weave texture and looks great in the office paired with a dress shirt and blazer, or casually with a t-shirt for the evenings and weekends.I am usually a size 8 in the jallade pants, and a small in dexter pants. For the cohen pique pants, I ordered a size 6 and they are perfect! I highly recommend these and I hope to buy as many colors as possible! The fit was nice and quality was exception, next want to try the conan without the pleats. Overall very satisfied with the pant. I actually prefer this material than the other Cohen pants. It is slightly thicker, has a little bit of a texture if you look very close. It looks and feels has a better quality. The reason that I gave it a 4 is because I am not a big fan of the elastic part in the back. I'd much rather have it without it. But I like this burgundy red color, which is not available in my favorite Jallade pants. Great price but I did not like the material. I can only buy the pique pant because the other fabrics fit much different, despite the fact that the cut should be the same. Please bring out more dark colours (khaki/olive, forest green, charcoal) in the pique pant!! I love the pique version of these since the fabric has some texture and interest. They’ve well-constructed and hit me just above the ankle bone (I’m 5’4”) and sit just below my navel. They are a lot more relaxed/roomy than the Conan pants (the ones without the pleats) though, so I likely could have sized down, although I kind of like the look of the volume at the thigh. That said, my thighs are pretty solid, so those with proportionately thin legs might be better off in a size down, particularly given the elastic waist.